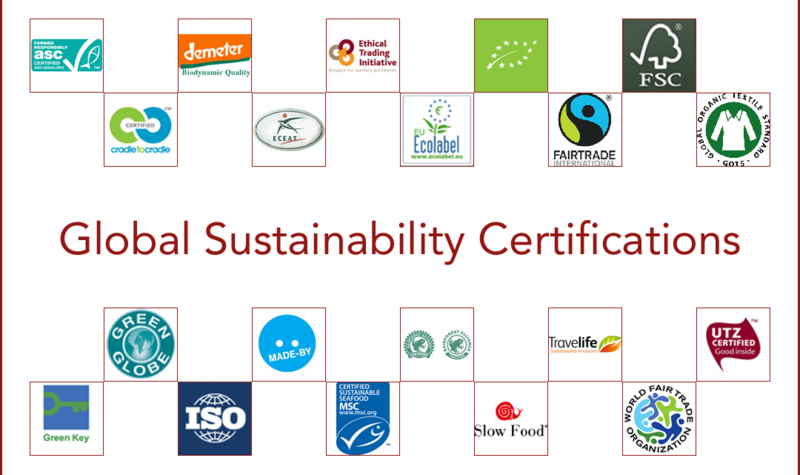 What are important green and Fair Trade certifications to pay attention to? To live a conscious life you need information. Information on the sustainability, environmental and social efforts a company makes, to guarantee a product or service that is made with respect for the environment, humans and animals. Green and Fair Trade certifications help us make conscious decisions, without having to dig up ALL the information ourselves. That would be a (more than?) lifetime job for one person. Finding your way in ‘certification-land’ is still quite a challenge. THERE ARE SO MANY! Some are better known than others, some overlap, some are just…vague. To help you find trustworthy certifications, we created this list that is useful for at home and for when you travel. We start with global green certifications, but will expand the list to national certifications, for the countries we have a city guide for. Green Key – An international eco-label for hotels and recreational companies. Companies awarded with the Green Key certification meet a set of high standard environmental requirements. There are six Green Key categories: hotels and hostels, campsites and holiday parks, small accommodations, conference centres, restaurants and attractions – covering the same 13 criteria areas. Green Globe – A global certification for sustainable tourism. The member organisations are committed to making positive contributions to people and planet. The Green Globe Standard includes 44 core criteria supported by over 380 compliance indicators. There are three Green Globe levels: Green Globe Certified, Green Globe Gold (certified for 5 consecutive years) and Green Globe Platinum (certified for 10 consecutive years). EU Ecolabel – The EU Ecolabel helps you identify products and services that have a reduced environmental impact throughout their life cycle – from the extraction of raw material through to production, use and disposal. FSC – Forest Stewardship Council – International certificate for responsible forest management. By promoting environmentally and socially beneficial forest management, FSC helps both local communities and the society at large to enjoy long-term benefits of managing forests in a responsible way. Cradle to Cradle – Sustainable and Fair Trade products – The Cradle to Cradle Certified™ Product Standard guides designers and manufacturers through a continual improvement process that looks at a product through five quality categories — material health, material reutilisation, renewable energy and carbon management, water stewardship, and social fairness. A product receives an achievement level in each category — Basic, Bronze, Silver, Gold, or Platinum — with the lowest achievement level representing the product’s overall mark. Rainforest Alliance – The Rainforest Alliance Certified seal certifies that products and services – such as coffee, chocolate, tea, fruit, flowers, paper and furniture – originate on – or contain ingredients sourced from – farms and forests that are managed according to rigorous environmental, social and economic criteria. Thus conserving wildlife; safeguarding soils and waterways; protecting workers, their families and local communities; and increasing livelihoods in order to achieve true, long-term sustainability. For tourism businesses it certifies that they meet the Rainforest Alliance comprehensive sustainability standards for tourism. Global Organic Textile Standard (GTOS) – The Global Organic Textile Standard is a global textile processing standard for organic fibres. The standard includes ecological and social criteria, backed up by independent certification of the entire textile supply chain (fibre production, processing and manufacturing). There are two label grades: 1. Organic and 2. Made with X% organic. ISO 14001 – Standards and certification for environmental management. The ISO 14000 family of standards provide assurance to internal and external stakeholders that environmental impact is being measured and improved. ECEAT International – ECEAT is a network of hundreds of small-scale accommodations and sustainable tourist services all over Europe. The network gives special attention to rural areas and organic farming and approves their contribution to local communities and protection of the environment. Thus promoting responsible travel. 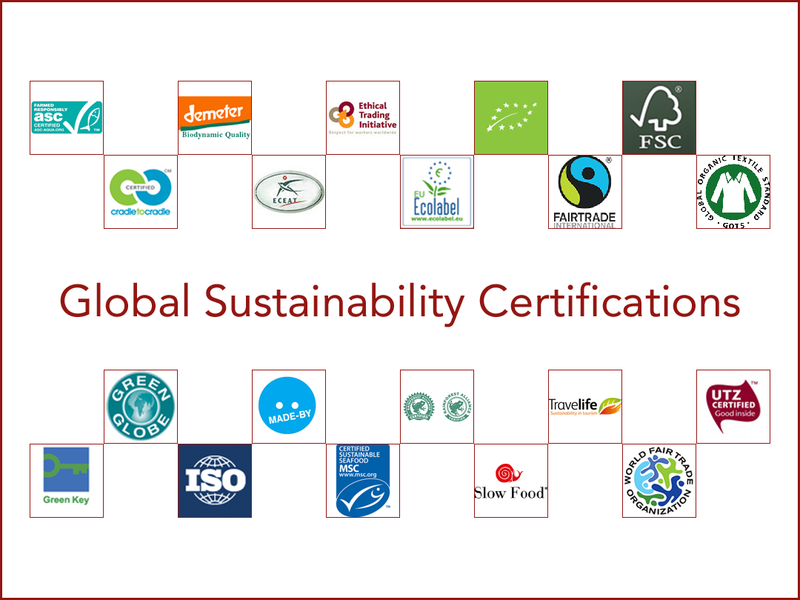 Travelife – International sustainable certification scheme for hotel members around the world, to improve their environmental, social and economic impacts cost-effectively. Travelife is dedicated to making holidays more sustainable. UTZ Certified – UTZ certified ingredients are grown by farmers who have been trained to implement better farming practices, with respect for people and the planet. When you see the UTZ logo on a product, this means the company supports sustainable farming by sourcing UTZ certified coffee, cocoa, tea or hazelnuts. Slow Food – Slow Food is a global, grassroots organisation to prevent the disappearance of local food cultures and traditions, counteract the rise of fast life and food, and combat people’s dwindling interest in the food they eat, where it comes from and how our food choices affect the world around us. MSC – Marine Stewardship Council – The Marine Stewardship Council is an international non-profit organisation fighting the problem of unsustainable fishing and safeguarding seafood supplies for the future. For this they use the blue MSC label and fishery certification program. You will find the blue MSC label on all sustainably caught wild fish and seafood. ASC – Aquaculture Stewardship Council – The Aquaculture Stewardship Council (ASC) manages standards for responsible aquaculture. Products bearing the ASC label come from fish farms that have met these standards. You will find the turquoise ASC label on fish and seafood that comes from farms that limit their impacts on the environment and the community. EU Organic Farming – EU label for organic farming. Products carrying the EU’s organic logo comply with strict EU rules and requirements for organic farming, processing and trading. Every farmer, processor, trader, importer or exporter is checked at least once a year. Demeter – A label for products from biodynamic agriculture. The products are produced by strictly controlled and contractually bound partners. Within the biodynamic agriculture, a farm is considered an individual, living and unique organism; beyond a closed farm system. Fairtrade International – A label for Fair Trade products. Fairtrade International is a global organisation working to secure a better deal for farmers and workers. Their approach is based on a partnership between producers and traders, businesses and consumers. MADE-BY – Clear and transparent information on sustainable and responsible fashion. MADE-BY is an European not-for-profit organisation, acting to improve environmental and social conditions within the fashion industry worldwide. Consumers can check the level of commitment and engagement of a brand in making more sustainable fashion through the results of the MODE Tracker. Ethical Trading Initiative – An alliance to stimulate and promote Fair Trade. Ethical Trading Initiative is an alliance of companies, trade unions and NGOs that promotes respect for workers’ rights around the globe. It is not quite clear how a member is actually performing in terms of Fair Trade. Being part of this initiative gives an indication on the ambitions of a company, but it will be good when ETI gives more transparent information, as they intend to do. World Fair Trade (WFTO) – Fair Trade products – Word Fair Trade Organisation is a global network of organisations representing the Fair Trade supply chain. Members of WFTO demonstrate 100% commitment to Fair Trade and apply the 10 WFTO Principles of Fair Trade to their supply chain.